My favorite inkle weaving book and the one I recommend to all new inkle weavers is called "Inkle Weaving" by Helene Bress. My copies have been "loaned" out but never have come back. Although I have been thinking for some time that I had better replace the last copy, I was waiting for the right situation. Well, it couldn't get "righter" than this. The author had a booth at Convergence! I met her at the Weavolution booth and then promptly went to her booth and ordered a copy. Today it came in the mail. She was very sweet and even complimented me on the sash I was wearing (one that I wove.) She has written several other books and was quite popular at the conference. You can visit the website for her publishing company here, Flower Valley Press and purchase a copy for yourself. I was also fortunate to buy one of the first hard copies of the book by Laverne Waddington, "Andean Pebble Weave". This came out first as an e-book, which I hesitated about purchasing. I was ecstatic when she decided to have some hard copies printed. On the way to the conference, the box of books was massacred, but most of it's contents survived with some of them suffering smudges and skid marks and a footprint or two. The author sold every last copy to anxious customers, dirt or not and even gave a premium with purchase of one of her pebble weave key fobs. From the first time I saw Laverne's work via her Flickr photo album, I was taken with it. She has learned from indigenous weavers all over the Americas and does a wonderful job of passing back that knowledge. 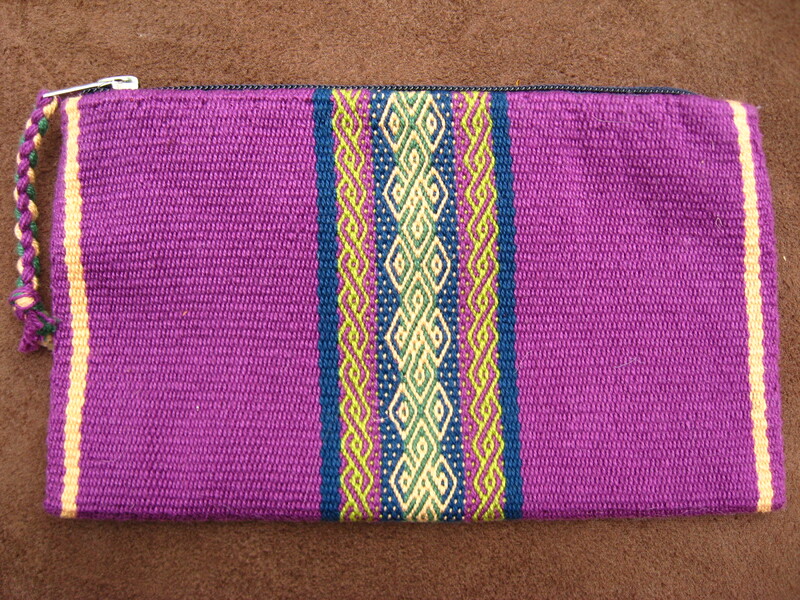 This beautiful purple bag is another example of her fine craftsman ship. When I saw a photo of it on Flickr, I began lusting after it. I was surprised to find it for sale at Convergence, and consider this another fabulous stroke of luck that I am now its proud owner. 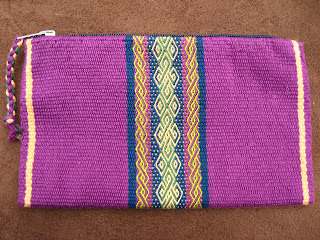 You can see more of Laverne's work and learn from her tutorials here on her blog at www.BackstrapWeaving.Wordpress.com . I too have Bresses book and it is VERY helpful! The bags is beautiful. Sounds like a great time all around getting to meet all those wonderful heros! I am hoping to have the floor inkle built from the Bress book. It is such an elegant looking loom! Hope your new copy is signed! Your convergence time looks so good. I haven't been to one since 2002 - next time! Much of what I have learned, at least at the beginning was from Helene's book. A friend built a floor standing loom from the plans in the book and I bought it from him. When I showed photos of the looms in a recent post, I didn't mention where the plans came from, only that it was homemade. You can get such a long warp on it! Now that I have been to one Convergence, I will be tempted to go again. Maybe I will see you there, Evelyn! New from Laverne Waddington! Instructions for Andean Pebble Weave on an Inkle Loom! I'll be Teaching at the Intermountain Weavers Conference in Durango, Co in July 2019.Click below. My Straps are Certified New Mexico True! Click the logo to learn about more True products. Click the logo below to visit my website! Browse the gallery of photos, or purchase a guitar strap. I love my MOO Mini Cards!! Click the photo to get 20% off when you order your own! Order A Guitar Strap Kit from my Etsy shop. An Excellent New Mexico Place for Fiber Enthusiasts!